Congratulations to Heather Sebastian, winner of the LovePop Cards Holiday Set! I can't think of anyone who wouldn't enjoy opening a pop-up card... the unexpected surprise is enough to bring a smile to the Grinch-iest of souls. Of course Christmas and Hanukkah are still quite a few weeks away, but I hope you won't mind this introduction to a brand new line of greeting cards from a small startup called LovePop. Wombi and John began brainstorming a long list of occasions and holidays that could be made even more special by the presentation of a pop-up card. 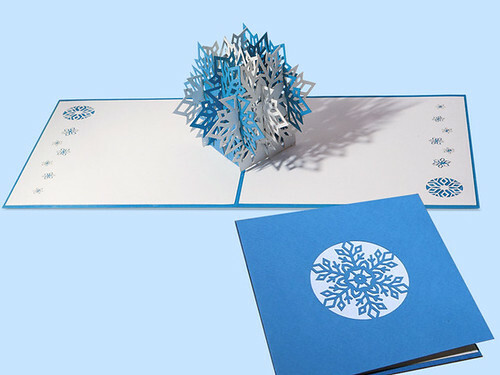 Encouraged by the positive effect that such intricate cards had on family and friends, they began developing a laser cut line of pop-up cards in earnest. 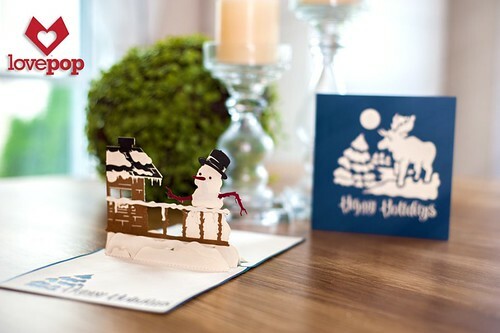 Each LovePop card combines paper engineering and delicate cut paper illustration. First, a prototype design is drawn and transferred into a computer to be cut with a Silhouette CAMEO® cutting machine. 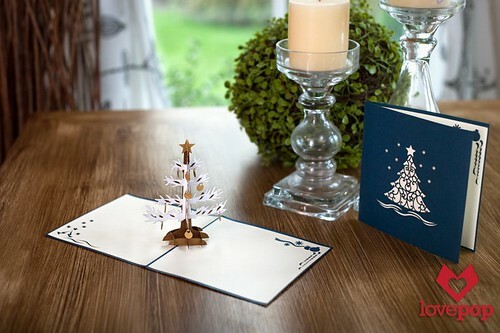 Once the design has been perfected, the cards are cut with a laser cutter, assembled, and glued by hand in Vietnam. 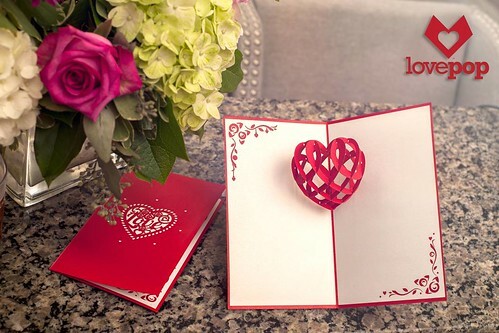 There is even an option to have a personalized, handwritten note added to the card before it is mailed to the recipient. Another nice thing about a pop-up card is that it is typically displayed far longer than an ordinary greeting card would be - a warm reminder of the sender. And while a Holiday LovePop card might well be put away with the decorations in January, chances are excellent it will be displayed for years to come. Of course once the holidays are over, the mantel doesn't have to stay LovePop-free for long... there's Valentine's Day and many other occasions that are deserving of a special card. You can see an array of options on the LovePop website. The LovePop Holiday collection is only available via Kickstarter at this time; a campaign is underway through November 8th. 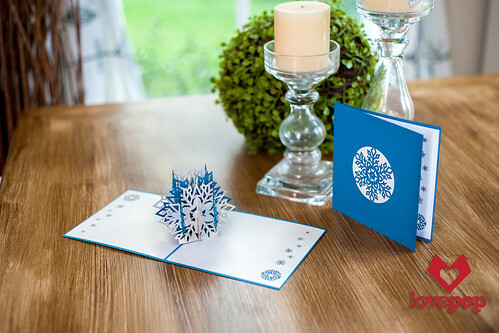 To help spread the word, LovePop has offered to send a set of three cards ($30 value) - Snowflake, Winter Cabin, and Christmas Tree - to one lucky commenter with a U.S. mailing address. To enter, just leave a comment on this post by the end of Sunday, October 26. Be sure to include a way to be contacted within your comment. To earn extra entries, share this post link on Instagram, Facebook, Pinterest, Twitter, and/or Google+. Leave a separate comment for each entry and please include the link to your share. The winner will be selected by a random number generator and announced as soon as he or she has been contacted. Follow along with LovePop on Facebook to see new cards as they are released and visit the Kickstarter page to meet LovePop's founders and learn more about the company in a short video. If you would like to sign up for the LovePop Cards newsletter (scroll to bottom of linked page), you will receive a coupon for 10% off. Such happy cards! I'd love to win and best of luck to Wombi and John. Oh wow - I LOVE pop up cards! And these are by far the prettiest I've seen a while! Hope their business adventure takes off! I would love to win this to send to my paper loving best friend! Incredible cards, beautifully cut and so intricate. Best of luck to Rose and Wise. I love making cards and sending them hope I win this one. These are absolutely beautiful! I look forward to seeing more designs. Fabulous cards, elegant and fun in the same breath. They will be a huge success. I can't wait to send one to my Sister-in-Law, she is the Queen of unique cards but I think these will be the winner!! These are the best pop-ups ...ever...! Would love to win.. I make better than these! And...I do not need to have Vietnamese slave labor in order to produce them. Get a life, folks! Dear Denice, we do our best to design the most delicate paper creations we can to help our customers express their care for each other. We love to learn from other designers and would love to learn from you. We treat every aspect of our business with the same care and respect we believe in and our customers wish to share with each other. That includes working hand-in-hand with our partners for months at a time in Vietnam, making each other better and ensuring that everyone is fairly compensated and has a great working environment. We are deeply committed to our partners' well-being, and they are passionate about making these cards. Thanks for sharing. These are absolutely wonderful. And thanks, too, for the link to their kickstarter page. Who doesn't love a pop-up? Don't have a US address but still wanted to say how awesome their work is! These are GORGEOUS! I'd la la LOVE to win! Absolutely awesome cards, I myself would love to be able to make them. Thank you for sharing. Love this card. I've always loved pop ups. These are incredible! Thanks for the giveaway and good luck to the creators! These are the BEST cards ever! I've never seen such intricate and delicate pop-ups! I would LOVE to win this contest - these are just terrific! love, Love, LOVE the Christmas tree and snowflake especially! I pinned this link to my Pinterest Board. These are so cute,i would love to have them!